We write about it in our paper: LTL Secrets Revealed. When a 3PL helps shippers collaborate, those companies gain the freight density they need to drive down costs. And they don’t need to rely on LTL networks. This simple “share the ride” concept, while nothing new, is surprisingly underutilized amongfood logistics companies. But more and more food shippers are starting to realize that their lack of freight volume doesn’t leave them without options. Let’s say that several food shippers need to get their products from the Northeast to the West Coast for final distribution. In the past, each company would make a separate deal with an LTL network. But with pool distribution, all of them can ship their product down the road to a regional 3PL consolidation center, where workers combine those loads onto a single truck for delivery to a pool distributor in the West. The Topps Company, known for its candy, chewing gum and collectible trading cards, uses a pool distribution program to move product from Pennsylvania to customers across the U.S. Each month, hundreds of TL trailers carry Topps’ product, along with freight from several other candy manufacturers, to pool points across the nation. There, workers break the bulk shipments into individual orders for local delivery. The first year Topps used the pool distribution program rather than LTL, it reduced freight costs dramatically. Topps also improved lead time by 20%, lowered handling rates, and reduced chargebacks. Freight consolidation opportunities don’t end with the linehaul delivery. Many food companies ship to the same regional DCs of Walmart, Target, CVS and other mass retail and grocery chains. A 3PL can use transportation management software to review pending retail orders, comparing ship-to points and requested arrival dates for different vendors. Based on this analysis, the 3PL loads one truck with multiple vendor orders for the same retailer. Sun-Maid Growers of California uses a retail consolidation program to ship raisins and other dried fruits to customers in New England and Mid-Atlantic states. 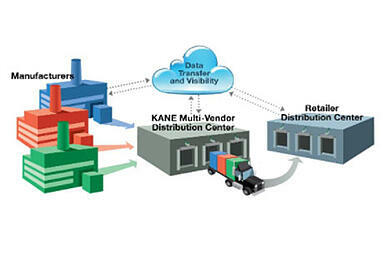 KANE is Sun-Maid’s Northeast distribution partner and also serves other food shippers that share retail customers with Sun-Maid. As a result, Sun-Maid orders can ship in the same trailer with candy, snack foods, condiments and other grocery items. The costliest miles for a truck are the first 50 and the last 50. Temp-controlled LTL is expensive because it involves multiple first and last mile sequences – as many as six. Freight consolidation strategies combine freight from multiple 3PL customers to create direct, lower-cost truckload shipments.